ONLY $9.99! ON SALE FOR $2.99! 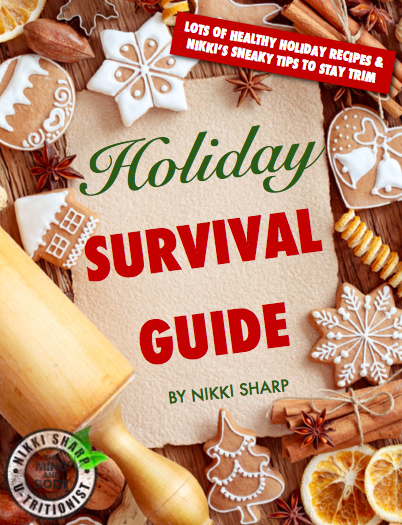 Nikki Sharp’s ‘Survival Guide’ for the holidays is here. Get all the tools you need to stay trim during the festive season. The BEST egg nog recipe you need to try! Are you scared of gaining weight this holiday season? Do you dread having to go to parties because of all the temptation? Are you afraid of ruining all the progress you’ve made with your health and fitness in one quick month? 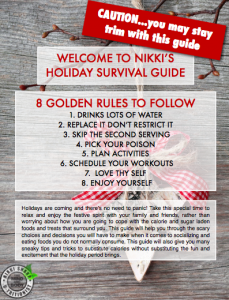 I designed the HOLIDAY SURVIVAL GUIDE to help you tackle every challenge you face during the holiday season. 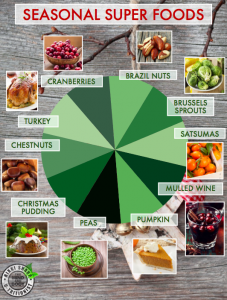 The answers to your questions are in this guide, plus my personal tips and tricks to stay slim this holiday season. 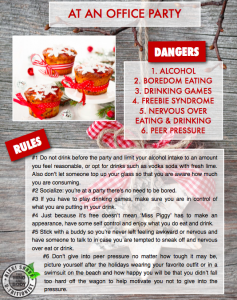 The Holiday Survival Guide is an Adobe Acrobat PDF file that you simply download to read on your computer, laptop, iPhone, iPad or iPod touch. 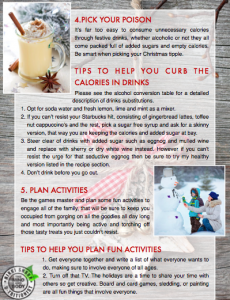 The Holiday Survival Guide’s printable format allows you to easily print and save your inspiration and recipes in a custom binder for further reference. Get the practical know-how with over 65 pages of healthy swaps to your favorite dishes, clean eating recipes, information on surviving parties and tools to help you stayon track. Year after we fall prey to the same old routine of eating too much, not exercising enough and gaining weight. Don’t let that happen this year! My e-book will help guide you on keeping the weight off and help you really enjoy the time with your friends, family and all those parties.